This is a cast of a typical example of an Aztec biface. Aztec bifaces are reported to have been used in blood sacrifices and buried in ritual offerings as "personified" forms of different deities. Bifaces like this have been found in excavations of ceremonial caches in the ancient Aztec city of Tenochtitlan that is now located under the modern day city of Mexico City. These unique ritual tools are also referred to as Aztec knives. This biface measures 6 13/16 inches (17.3 cm) long. 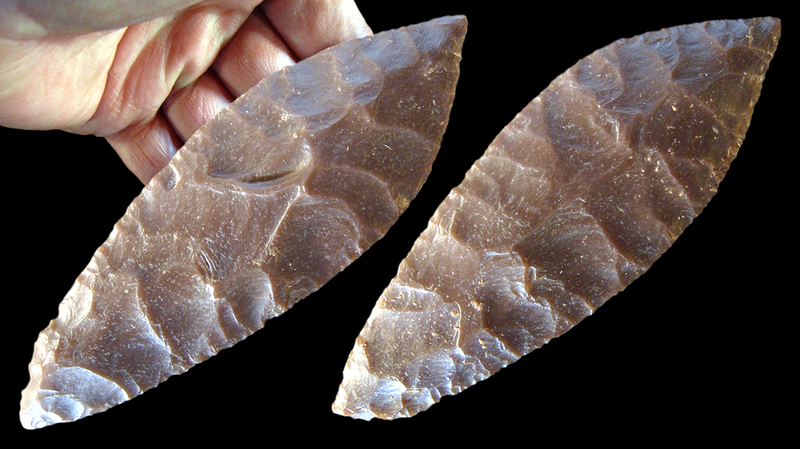 It's made of a semi-translucent brownish/red colored tabular chert that was commonly used by Aztec flint-smiths. Recent excavations in the sacred precinct of Tenochtitlan at Templo Mayor in Mexico City, is providing new information about these types of Aztec ritual knives. The discovery of a ceremonial deposit contained within a stone box that is designated as offering 125 is particularly important. The cache dates to sometime between 1486 and 1502. The stone box is located at the foot of the staircase leading to the Templo Mayor and it represents an entrance to the underworld. The cache contained 3,800 artifacts including 27 bifaces that were decorated as gods, priests and warriors. The artifacts were placed in the box in layers. The lower level contained the body of a dog that was surrounded by 19 decorated knives and in the upper level two golden eagles were buried with eight decorated knives. Some of the knives located at the top of the cache were attached to copal bases and stood upright. These knives bore eyes and teeth and carried miniature weapons made of wood, flint and shell. Other knives lower down in the cache had irregular copal bases or none at all. Copal was an aromatic tree resin that was burned as incense. Some of the bifaces in offering 125 were identified as representing at least three Aztec gods in the form of Ehecatl-Quetzalcoatl, Xochipille and Techalotl. The most important god is Ehecatl-Quetzalcoatl who descended to the underworld to retrieve the bones from which humanity was created and introduced maize and auto-sacrifice (self-sacrifice such as blood-letting). This knife was adorned with a "wind jewel" in the form of a truncated shell worn on the chest, a curved scepter, a marine shell necklace, earrings in the shape of speech marks, a headdress representing star eyes, the image of a bone needle made of gold leaf symbolizing auto-sacrifice, monkey fur, and a duck-shaped pendant. Xochipille represented the god of music, games flowers and dance. This knife was identified as Xochipille from a drop-shaped pendant made of mother-of-pearl. The other god, Techalotl, is associated with the ritual drink pulque (alcoholic beverage made from the fermented sap of the maguey plant). Other knives in the cache were believed to represent gods but there was not enough evidence to link them to any of the deities. But there were other knives in the stone box that were "dressed" with weapons that identified them to warriors. These objects were represented as a wooden pectoral in the form of a bow, a dart thrower (atlatl) and projectile points. A third group of knives were identified as a priestly category. Three of the knives were "personified" with gourd containers that were items used by priests to hold tobacco used in ceremonies. Some of the knives are reported to have been devoid of any decoration.